The war for the soul of Manhattan’s biggest apartment complex is over — after a detour into bankruptcy court — and the “middle class” gets to keep at least half of it. For another 20 years, anyway. The Blackstone Group, the world’s largest private-equity firm and one of the country’s largest holders of real estate, will buy Stuyvesant Town and its sister complex to the north, Peter Cooper Village, for $5.3 billion under an agreement that will preserve nearly half of its 11,232 apartments for middle-class families, Mayor de Blasio’s office announced Tuesday. Whether this means the complex will remain home to “families of teachers, construction workers, firefighters and others who have traditionally made their homes at Stuyvesant Town,” as the Times put it, is still unknown. 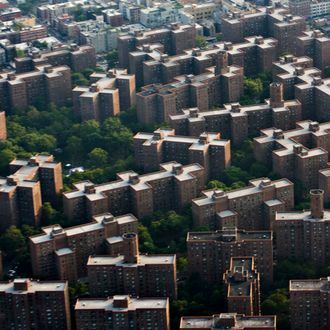 But for Stuy Town’s 30,000 residents, the deal puts an end to nearly a decade of uncertainty, which began when the complex was sold to Tishman Speyer Properties in 2006 for a record $5.4 billion. The plan was to polish up the brick high-rise campus, which was built by MetLife at the end of World War II between 14th and 23rd Streets east of First Avenue, and drastically raise the rents. This island of the middle class would then become more like the rest of the city. The new landlords handed out eviction notices like they were takeout menus, and soon hundreds of residents were fighting to stay in their homes. But Tishman Speyer couldn’t turn Stuy Town into its cash cow and failed to pay back the $4.4 billion it had taken out in loans. In January of 2010, CW Capital took ownership of the complex on behalf of Tishman Speyer’s lenders. According to the New York Times, more than half of Stuy Town’s apartments lease today at market rents. De Blasio has pledged to build or preserve 200,000 units of affordable housing in the next ten years. Under the agreement with Blackstone, 4,500 units will be reserved for households earning no more than $128,210 for a family of three, while 500 apartments will be reserved for families making no more than $62,150. In exchange for maintaining an affordability zone near the East Village, Blackstone will receive a $144 million low-interest loan through the city’s Housing Development Corporation and a $77 million waiver on mortgage recording taxes. But for the private-equity firm, the true payout will come later. Those affordable units are preserved for “decades,” in the most literal sense — two decades, to be precise. In 20 years they can be rented at market rate. who can still afford to live here?